The Phantom Energy plugin helps users determine sources of “Phantoms” for all sensors of a specified Display Group. 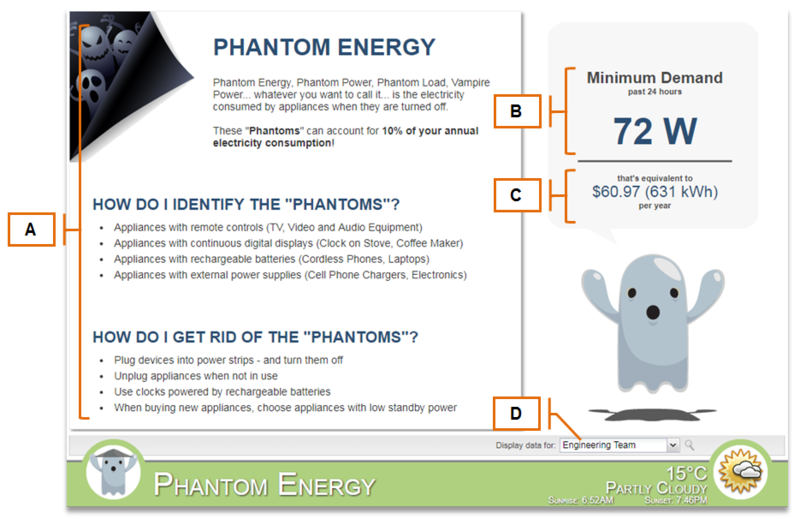 “Phantom Energy” is the electricity consumed by appliances when they are turned off, sometimes accounting for 10% of your annual electricity consumption. Phantom Energy Tips and Resources Provides useful tips on how to identify and reduce the phantom power load of a building. 24-Hour Minimum Demand The minimum (aggregate) demand in the past 24 hours. Minimum Yearly Projection Projects the 24-hour minimum, using an average hourly rate, over the span of an entire year to estimate annual consumption and cost. Display Group If there is more than one Display Group associated with your account, you can specify which one to display data for by selecting the Display Group from the dropdown menu.